There are many sites on the web that give Hidden Chronicle images where you can find almost or all items to be found on them. Just Google search and choose your favourite. 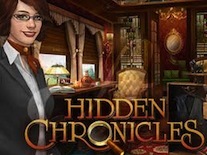 I find the images on the Hidden Chronicles wiki http://hiddenchronicles.wikia.com/ probably the best done images on the web. However, I have trouble finding things on these images. I've used these images, changed them, created an index and I can find what I'm looking for a little easier.